Since our start as a home laundry service in 1916, Sunshine Laundry has been putting its customers first. While our business focus has evolved over the past century, this emphasis on service excellence continues. 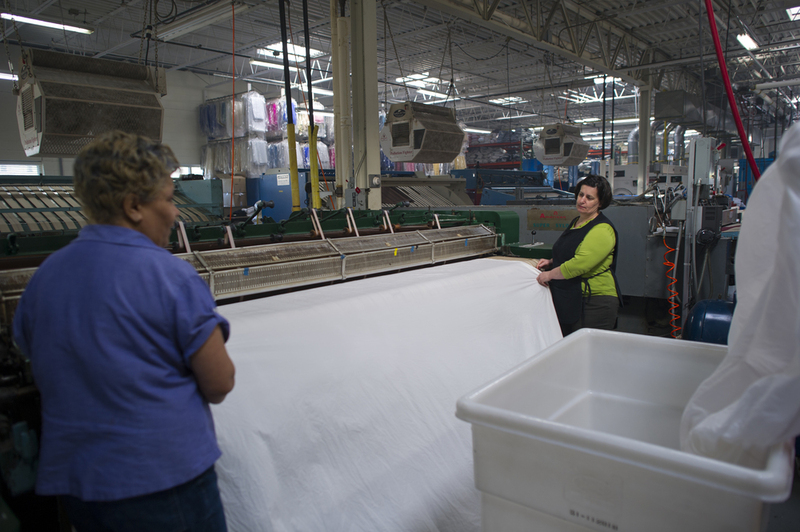 More specifically, in the last twenty five years Sunshine Laundry has transformed itself from a home laundry service to a specialty linen rental service, boasting a large inventory of high quality table linens and accessories. 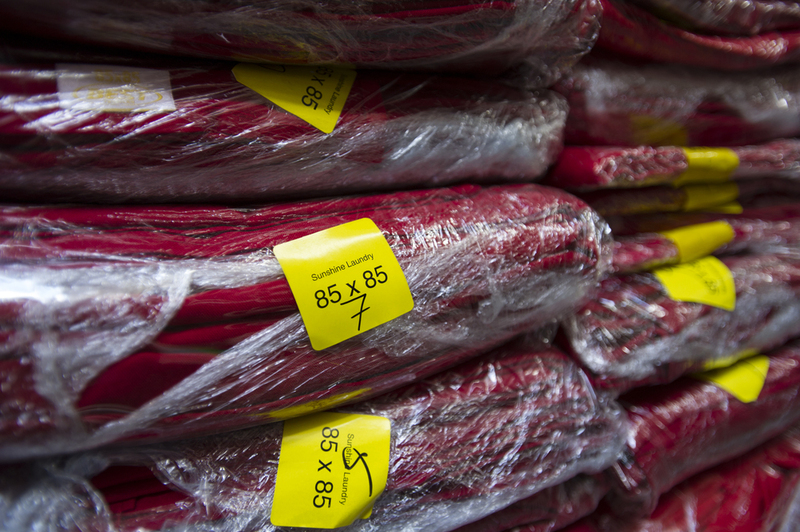 Having a vast inventory on hand allows us to easily cater to any size, color, or fabric requirements that might be needed for your special event. Getting what you want when you want it, is another key reason to choose Sunshine Laundry. Our dedicated team of drivers and customer service representatives have time built into their day to fulfill those last-minute modifications or requests that will make your event unique and memorable. Furthermore, Sunshine does not lock recurring customers into dedicated linen orders. 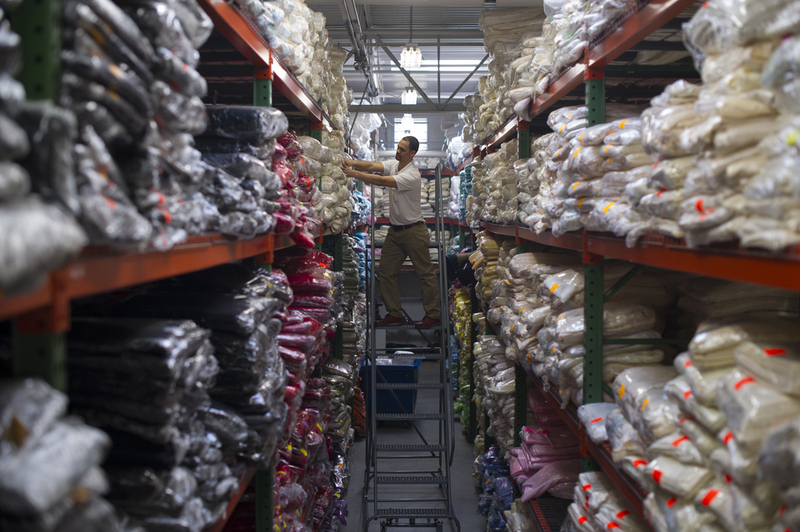 Instead we offer the flexibility to select any linens from our inventory and modify a standing order to suit your needs. So the next time you’re planning an event or shopping for a regular linen supplier, stop by or give us a call! Sunshine Laundry is dedicated to making continual improvements and investments to decrease our environmental footprint. At Sunshine we know that this commitment relates to both the source of energy and how efficiently the energy is used. In order to use cleaner energy we used the roof space of our 15,000 square-foot facility to install a solar system. Our new solar system is designed to produce about 75.19kW. To put this into perspective an average home solar system produces about 4kW. In addition, Sunshine has reduced the amount of electricity needed for our day to day operations. One way was to retrofit LED lighting into all our existing lights. Another was the purchase of a Rotary Vane air compressor. This type of compressor has the ability to respond and change its air production to the usage where as a traditional compressor runs at full power regardless of the demand. 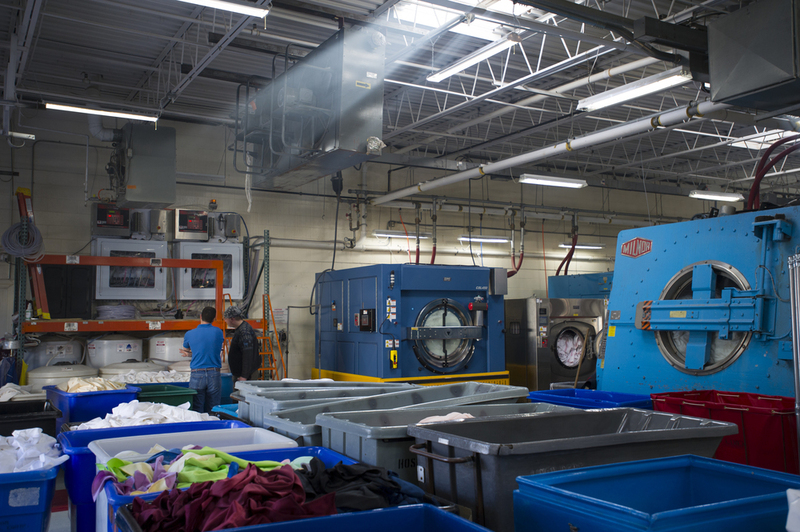 As one can imagine, a commercial laundry like Sunshine has a high demand for hot water. In fact at Sunshine we have a 5000 gallon hot water heater that brings incoming city water up to 160 degrees before it is sent to the wash room. To generate this volume of hot water we use a 150 horse power steam boiler. This year we added a stack economizer to improve the efficiency by which we make hot water. The stack economizer works by passing incoming city water through the exhaust stack of our boiler. The efficiency gain is achieved when incoming water passes through the 400 degree exhaust it rises in temperature an average of 60 degrees. This increase in water temperature allows our boiler to throttle itself down, significantly reducing the amount of natural gas we need to burn in order to meet our hot water demand. Copyright © 2016 Sunshine Laundry. All rights reserved.